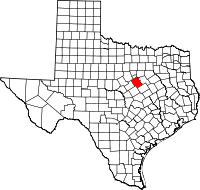 Bosque County (/ˈbɒski/ BOS-kee) is a county located on the Edwards Plateau in the U.S. state of Texas. As of the 2010 census, the population was 18,212. Its county seat is Meridian, while Clifton is the largest city and the cultural/financial center of the county. The county is named for the Bosque River, which runs through the center of the county north to south. The Brazos River makes up the eastern border along with the Lake Whitney reservoir it feeds. Since 2015, Bosque County has been represented in the Texas House of Representatives by the Republican DeWayne Burns. The previous 10-year representative was the Republican Rob Orr of Burleson. According to the U.S. Census Bureau, the county has a total area of 1,003 square miles (2,600 km2), of which 983 square miles (2,550 km2) is land and 20 square miles (52 km2) (2.0%) is water. As of the census of 2000, there were 17,204 people, 6,726 households, and 4,856 families residing in the county. The population density was 17 people per square mile (7/km²). There were 8,644 housing units at an average density of 9 per square mile (3/km²). The racial makeup of the county was 90.75% White, 1.92% Black or African American, 0.55% Native American, 0.11% Asian, 0.03% Pacific Islander, 5.17% from other races, and 1.47% from two or more races. 12.23% of the population were Hispanic or Latino of any race. Bosque County is currently listed as part of the Dallas-Fort Worth DMA. Local media outlets include: KDFW-TV, KXAS-TV, WFAA-TV, KTVT-TV, KERA-TV, KTXA-TV, KDFI-TV, KDAF-TV, and KFWD-TV. Although located in Central Texas and a neighboring county of the Waco and Killeen – Temple – Fort Hood metropolitan areas. Meaning all of the Waco/Temple/Killeen market stations also provide coverage for Bosque County. They include: KCEN-TV, KWTX-TV, KXXV-TV, KDYW, and KWKT-TV. Calvin M. Cureton, Texas Attorney General from 1919 to 1921, Texas Chief Justice 1921-1940. James T. Draper, Jr., Texas Southern Baptist clergyman was a pastor in Iredell in Bosque County in the late 1950s. James E. Ferguson 26th Governor of Texas. Miriam A. Ferguson, James' wife and the 29th and 32nd Governor of Texas. Earle B. Mayfield, Texas State Senator, United States Senator. John Lomax, American musicologist and folklorist. Bosquerama, 1854-1954: Centennial Celebration of Bosque County, Texas (Meridian, Texas: Bosque County Centennial Association, 1954). William C. Pool, A History of Bosque County (San Marcos, Texas: San Marcos Record Press, 1954). William C. Pool, Bosque Territory (Kyle, Texas: Chaparral, 1964). Wikimedia Commons has media related to Bosque County, Texas. Bosque County Collection The Archives of the Bosque County Historical Commission.